Why Choose Trinity Catholic Primary School? St Mary’s was the first Catholic School built in Murrumburrah in 1877 until a rise in population saw the introduction of St Columba’s in 1917. 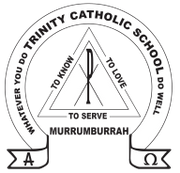 Due to a decline in town population, the two schools merged in 1980 to form Trinity Catholic School which has continued to flourish. It is through the support of the local community, the numerous priests and religious sisters who worked tirelessly for the children of Harden and Murrumburrah, dedicated teaching staff and parents that Trinity Catholic School has survived and prospered for 134 years. Saint Mary's Church situated in the school grounds provides a sacred place for community prayer and celebration. The foundation stone for St Mary's Church was laid on the 27th September 1868 by the Right Reverend William Lanigan DD Bishop of Goulburn. It was the first church of any denomination to be built in the district. Our Lady of Mercy Parish administers to the Catholic Community of Harden, Murrumburrah. There are two churches: St Anthony’s Church in Harden and St Mary’s Church in Murrumburrah.